My father participated in Deep Freeze III and IV on the USS Brough DE-148 from '57-59. A picture of a plaque my father purchased from a foundry in New Zealand in 1958. 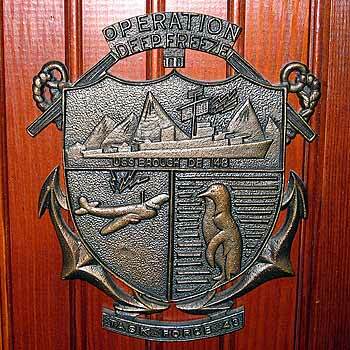 It is a reproduction of the seal that was stamped on the outgoing mail. He believes there were only about 30 of them made.